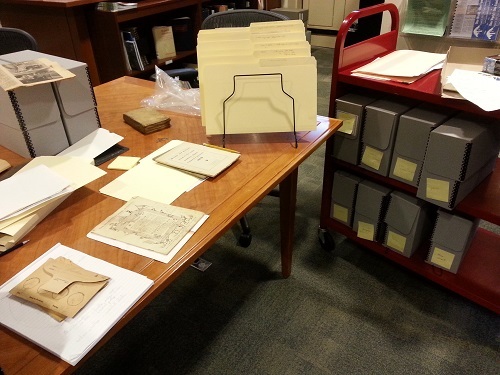 How do archivists organize collections? In our posts on what archivists do and on what it’s like to visit the archives, we promised you a closer look at how archivists organize collections. Here it is: we hope this post demystifies some of the terminology and techniques archivists use. But most of all, we hope to convince you that what makes archival research a bit slower is also what makes it so rich. As a new archival researcher you might assume that archivists group documents together based on the topics they cover. So, you might ask us where we store all our information on a particular subject; say, railway stations, aboriginal history, agricultural fairs, or shoe factories. What you’ll find is that archivists may send you off in multiple directions to comb through sometimes unlikely and unrelated groups of records. For example, to research aboriginal history here at the Peel Archives, we might suggest looking through the 1930s papers of a wealthy industrialist, the 1840s letters of an Irish settler, and government land records; to research 1920s railway stations, we might recommend regional planning records and the papers of a town seamstress. All these groups of records will be listed and stored separately; they’ll also need to be searched separately. And they’ll cover all kinds of topics beyond your own main focus. So unlike libraries, archives don’t organize individual items by subject matter. But why not? Wouldn’t that make things easier to find? And if we archivists don’t organize records by topic, in what sense are we organizing them at all? To answer these questions, let’s think about what archives collect. Archives primarily collect records. Acting individually or together, people produce records simply in the course of living their lives and conducting their business. Without even being aware of it, every time you scribble a grocery list, type an email, snap a photograph, or take meeting minutes, you’re documenting all kinds of information about you and the world you live in. When this farmer recorded the tasks completed by his farmhands, he didn’t know he was also recording for posterity information about labour practices, the cost of living, and even climate change. By fixing information on physical media, like paper, film, or hard drives, you’re creating firsthand evidence of your activities. Records are the documentary footprints people leave on the world. As the tangible direct traces of past activity, records are the primary sources – the raw material – that we use to understand the past and to plan for the future. (Secondary sources, like the books historians write, are produced by examining and drawing conclusions from primary sources.) 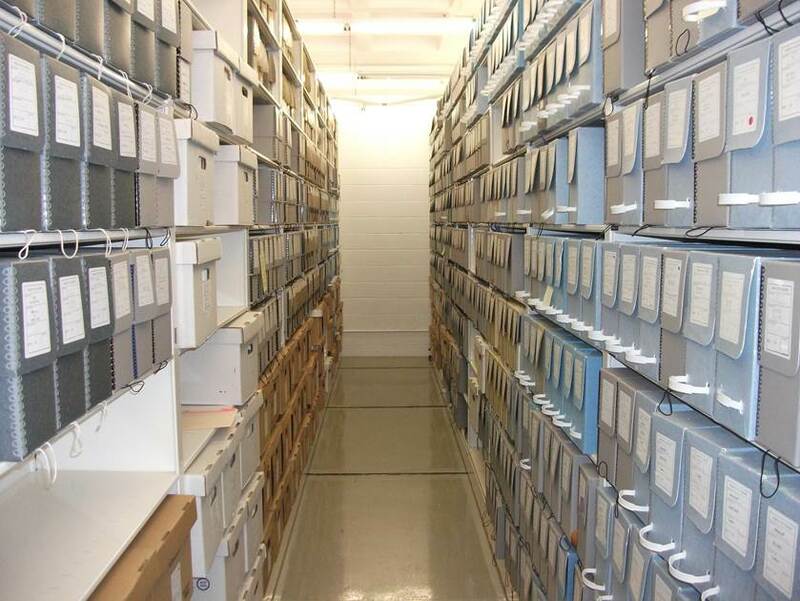 Archivists need to decide what records should be kept to document our shared past. Records accumulated over a person’s life, or over the period an organization functions, reveal even more about human activity. 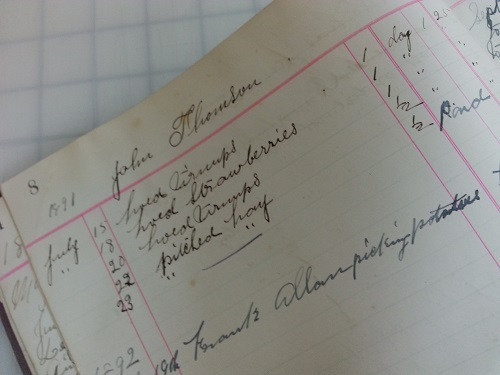 Patterns and interconnections between records shed light on how a person lived, or on how an organization carried out its business. 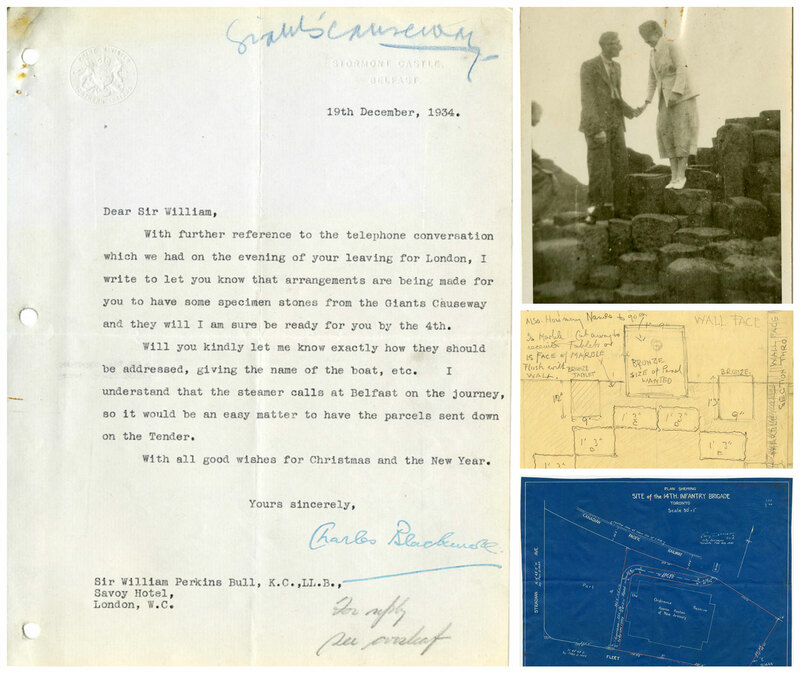 For example, the return addresses on a group of someone’s letters can reveal his itinerary; government records stored together can show how an important decision was made. The whole body of records is more than the sum of its parts. In fact, a lot of what we can learn from an individual record is actually related to other records around it. If individual records are footprints, groups of records are like trails of footprints showing routes and detours. So records are closely linked to why and how they were created, used, and collected. And this is why archivists keep records together based on who created and collected them – if we didn’t, all that extra information found only in the whole group of records would be lost, even if all the individual items were kept. This is also why, when you look up archival material, you’ll notice that it’s listed under the name of that creator. 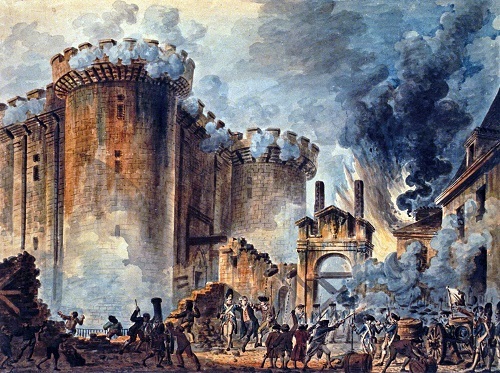 The seeds of the idea of the archival fonds originated in the French Revolution as French archivists grappled with maintaining official records at a time of immense political and social upheaval. 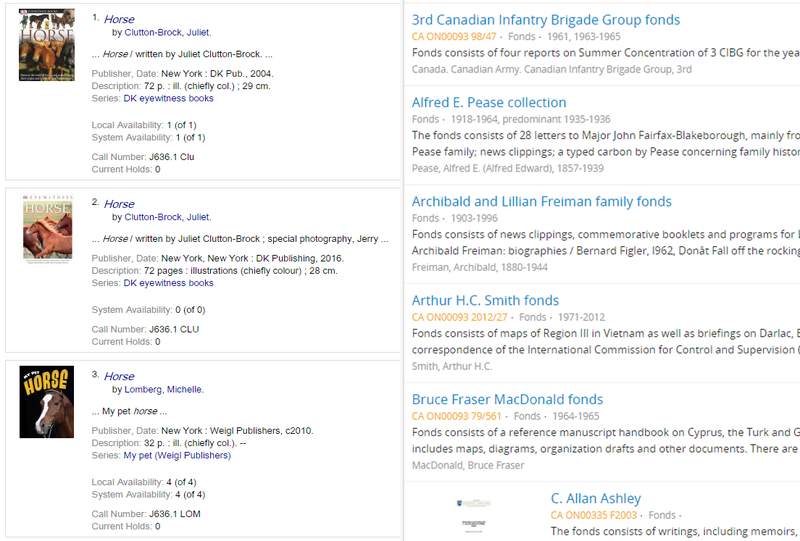 Many archivists around the world, including here in Canada, refer to the accumulated body of the records of a person or organization as the fonds of that person or organization. This word is taken from the French phrase respect des fonds, an archival principle which tells us to acknowledge the source, or provenance, of records when we organize them. Records have so much more to say to us when we know why, how, and by whom they were used and gathered. 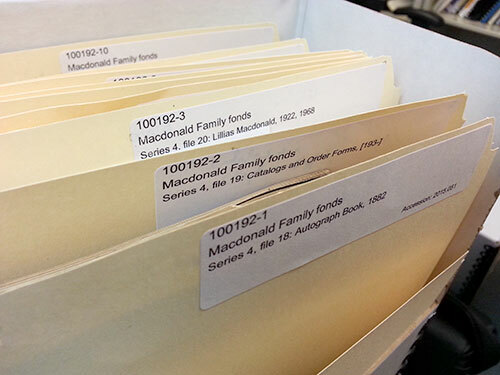 You might be surprised to learn that in the archival world, a fonds is technically different from a collection. Collections are materials that are deliberately gathered and artificially organized by somebody, based on a theme or topic. Some examples would be a postcard collection of waterfalls, or a set of newspaper clippings about local history; such groupings aren’t usually created incidentally as the natural result of the collector’s daily activities or business. Besides the concepts of fonds and provenance, another important guiding principle we keep in mind is that of original order. We try not to disturb the way creators arrange their own records because that order tells us so much more about creators and about the records themselves. This file of mixed record types from the William Perkins Bull fonds demonstrates the importance of keeping related records together. It contains documents concerning William Perkins Bull’s mysteriously aborted attempt to erect a monument dedicated to the Irish Regiment of Canada in Toronto’s Armoury using imported stones from Ireland’s Giant’s Causeway. The documents in this file include many letters, together with some blueprints, photographs, and sketches. took out the blueprint and put it in a general collection called “blueprints”? took out the photograph and stored it with other “photographs of Ireland” in our collection? removed this whole file from the body of Perkins Bull’s fonds and put it in a general collection of “monument planning records” or “Irish-related records”? You also may notice that groups of records are subdivided into series, and series are further subdivided into files. Not only does this hierarchical organization make things easier to find, but it also often reflects the way people structure their lives and business. 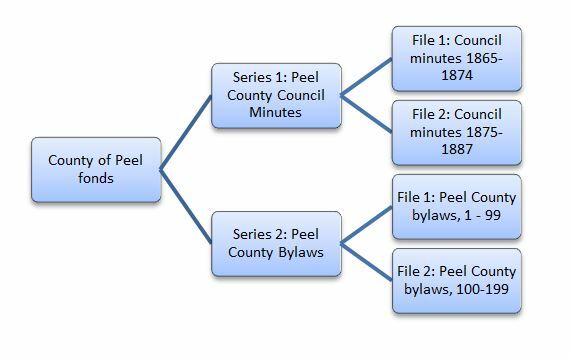 This flowchart of a very small selection from the Peel County fonds shows how fonds, series, and files are related. So if archivists don’t want to disturb the way records were originally organized, what are we doing when we arrange records to make them useable? The task of arranging archival collections can take up a lot of space – it’s a physical as well as an intellectual exercise. A lot, it turns out. You’ve probably already thought of several ways real life might be messier than the above principles and definitions. The skill of the archivist comes in dealing with the messiness of life as it’s represented in records and documents. It’s not always easy to determine why records were originally organized the way they were or even where they come from. How else can we seek informative context? A group of records may have been created by one person and then added to and re-organized by another. Whose records – whose “fonds” – are these? How can we tell the work, and so the lives, of different people apart? What about collections that are found within fonds? What does the habit of collecting tell us about a person or group’s life and about collections? What happens – and it frequently does – if a fonds gets split up over the years as people remove parts of it? If multiple archival institutions inherit different parts, how can we present a cohesive picture to researchers? What happens – and it frequently does – if an original order (if it ever existed) is barely or no longer discernible? How do we impose one that isn’t misleading? How do we balance original order with trying to make things easy to find? Juggling all these factors means archivists need to draw on heavy doses of informed judgement, a fine balance of analysis and synthesis, a good depth of general knowledge, and honed research skills. And yes, many times we have to create order out of chaos. Sometimes the relationships between documents are subtle. The records shown on the left were stored together by the person who collected them: somebody’s will; an unfinished letter to this person dated a few months before her death; a draft of her death notice; a letter written to her many years after her death in apparent ignorance of her death. Might these documents, taken together, tell a story? Or is their juxtaposition a coincidence? The archivist will ask these questions as she arranges the collection this material was found in. Here’s another thing to think about. Human beings are unique; this means every group of records is unique too. While archivists use the concepts mentioned above to guide them, every collection they work on will present its own challenges and rewards. 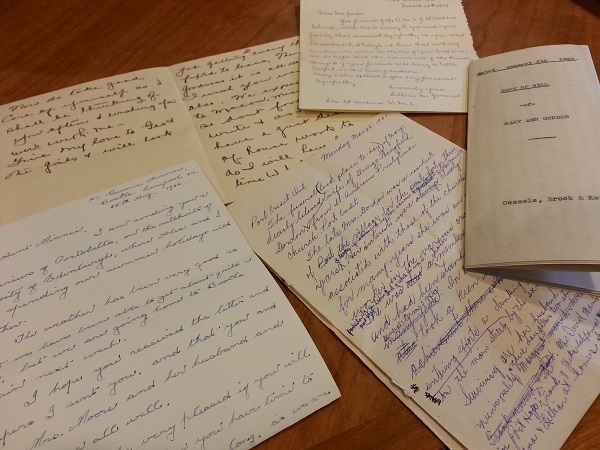 It’s no wonder that organizing archival records can be a time-consuming process. However, once archivists have arranged and described records, they become an accessible part of the human story. What else do the principles of archival arrangement mean for archival researchers? Because records are parts of collections, every individual item you access is surrounded by other records that you get to encounter as a result. Who knows what else you might discover? And – going back to the beginning of this post – this is why at the Peel Archives, you’ll find information about aboriginal peoples in such different collections: Perkins Bull, the industrialist mentioned above was personally interested in Canada’s indigenous people and collected accounts of them whenever he could; the Magrath family from Ireland who settled in Erindale in Peel wrote about meeting these people in their letters to Dublin; and land records show the evidence of the dwindling reserve areas of the native people. As to why you’ll find information on railway stations in the papers of a town seamstress: she collected old phone directories complete with station timetables. ← What do archivists do all day? Reblogged this on Alexandra Vidal . Great blog on a complicated subject! And unlike libraries, archives hold the lure of the ‘undiscovered’, or at least the ‘unlisted’ item waiting to be found …. Great synthesis, thank you for posting! And thank you for your encouraging comment! Admittedly it was challenging post to write. I just wanted to thank you for posting this series. Understanding the ‘ways’ of archivists has really helped improve my ability to search through online records. Really enjoying the read. Thank you so much Catherine! It makes our day to hear that. All best wishes for your research adventures! Very true. When genealogists are using original records in an archives, they’re using archival records – and archives are a world in themselves. As a non-archivist I found this article very useful – thank-you. I would appreciate knowing more about the numbering system used to identify particular records within a fonds. If you have a letter within a particular file within a fonds, do you number only to file level or do you number the letter as well? I can see the value of a number in linking a digital copy with the original physical item but there are also issues over writing numbers on original documents, etc. If a number is not placed on that letter, then I presume it is critical that documents are never disassociated from their files because otherwise one does not know where to return them to their correct position within the system. Thank-you for your most informative response – I have a much better understanding of what is involved. Looking forward to more posts on other topics (e.g. principles for integration of digital with physical archives and dealing with born digital content would be interesting). Thank you for asking, and for your encouragement. The question of how best to preserve and ensure future access to digital material (whether digital surrogates of non-digital records or born-digital material) is The Big Issue for archivists as you probably know, and is being debated as we speak. But the general challenges all archivists are wrestling with would indeed make a great post or two. The really really short summary is that it’s much more complex and problematic than many people imagine. Stay tuned! And thanks again for commenting. Very informative for me as a librarian who is involve in archival activities. Thank you for commenting Emma – it’s great to know our fellow professionals are finding this helpful. thank you. may l ask the preparatory work that should be done by archivist when receiving records from the records centre.